Teach coordinates and basic commands with this coding concept box! Perfect for classrooms, scout troops, homeschool groups, and after school programs! Classroom boxes build on each other over time, introducing more complicated coding projects and coding commands as you go. This box is the best box to start with for your coding kiddos. The projects inside this animal-themed box provide practice using coordinates to place stamps and other objects precisely where you want them to be. 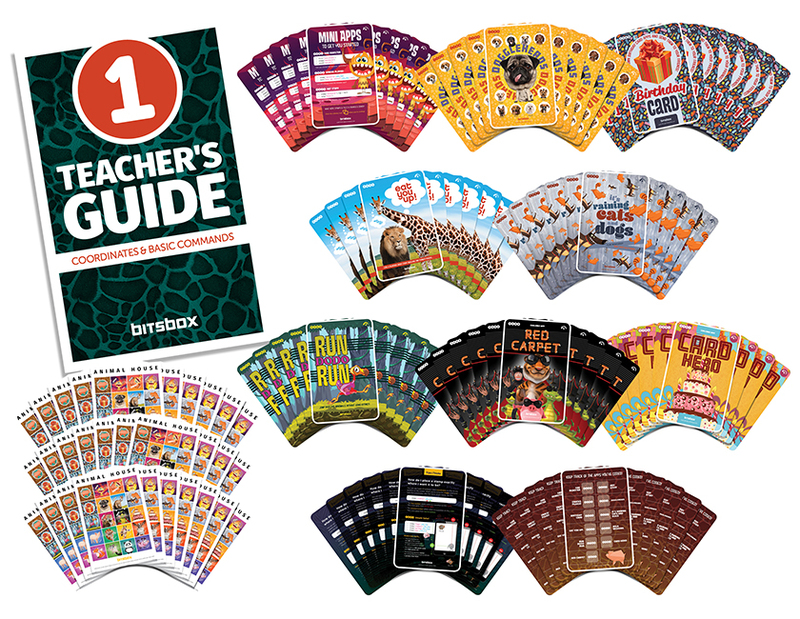 The Teacher’s Guide explains the use of coordinates and the Bitsbox fill, stamp, and text commands. There’s also a glossary for each coding project detailing project complexity, coding concepts included, instructions on how to use the app, suggestions to alter the app, and a URL to see the app in action. 1 How To Bitsbox card: 3 mini apps to get you started! Doggleheads: Combine different heads and bodies to create new dogglehead breeds! Eat You Up: Code a hilarious short story involving two former friends. It’s Raining Cats and Dogs: Feline adventurous? Don’t step in a poodle. Run Dodo Run: Jump over evil windmills without going extinct! Birthday Card: Make your own birthday card app and send it to your friends! Red Carpet: Use code to put these movie stars where they belong! Card Hero: A giant virtual cake is almost as good as the real thing. 1 Tips and Tricks card: Step-by-step examples that reinforce the use of coordinates. How do I place a stamp exactly where I want it to be? How do I make a stamp exactly the size I want it to be?